All over the world, kids play the “Bloody Mary” game, daring each other to say her name three times in a mirror. But no one has ever died from it. Until now. Sam and Dean must find a way to stop her before she claims another victim. I have never and will never say Bloody Mary in front of a mirror. With that out of the way, I’m looking forward to seeing this episode again because I remember it as being one of the creepier season one episodes. Okay, so we start off with little girls hanging out playing Truth or Dare (I also never picked Dare…I know, I’m such a thrill-seeker [sarcasm]), and one girl is dared to go say Bloody Mary in the bathroom. NO. DON’T DO IT. Seriously, what’s the worst that can happen? Your friends call you a chicken or tease you? Who cares?? It’s okay to be scared of things! Anyway, she follows through, but the twist is that Bloody Mary appears and kills the girl’s father, not the girl. This Bloody Mary reminds me a lot of the girl in The Ring. So this is where the boys come in. Sam and Dean. I love seeing them in a library doing old-school research, with the computers out of order. You know, I don’t really remember details about the Bloody Mary urban legend. I remember being told that you had to say Bloody Mary in front of a mirror three times, in the dark, but I don’t remember if there were any other details, like how she would kill you. I actually don’t even know if the legend I heard as a kid involved death – I think it was just scary enough that she would appear. So we see here that, since Mary is basically a spirit, Sam and Dean’s logical next step would be to ‘burn the bones’: dig up the corpse and burn it. However, in this case it seems that there is no body/no bones to burn. So what do you do then? You look for an object of significance, like Mary’s mirror. Oh boy, this scene in the high school reminds me how boring school could be! Oh man, I’ve said it before and I’ll say it again, I really love seeing the evolution of cell phones and technology on this show! Annnnnnnd we’re starting to get hints of Sam’s psychic dreams, and I think we see here that he still feels guilty about Jessica’s death. I like the way they worked together to take down Bloody Mary, and I think the effects were pretty good. 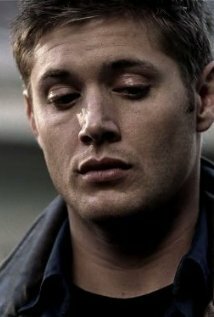 And of course, the appearance of one of the major tropes on Supernatural: one of the brothers (Sam, in this case) is keeping something from Dean. He has a secret that he won’t share. This episode, on a rewatch, is definitely not as creepy as I remembered it being, but that could also be that what creeps me out has changed since I saw this episode for the first time. This episode hints at the bigger story, but we are still facing a Monster of the Week episode.